My first car was a used 1963 Dodge 880. It was reliable for the most part, but one day when I stepped on the brake in a supermarket parking lot, nothing happened. I began to roll down an incline, and I struggled to steer around the maze of parked cars in the lot. After what seemed to be an eternity I managed to navigate my way out of the lot into an adjacent cornfield. The soft ground and corn stalks finally brought me to a stop. I later discovered that the reason my brakes failed is because their linings had completely worn away. 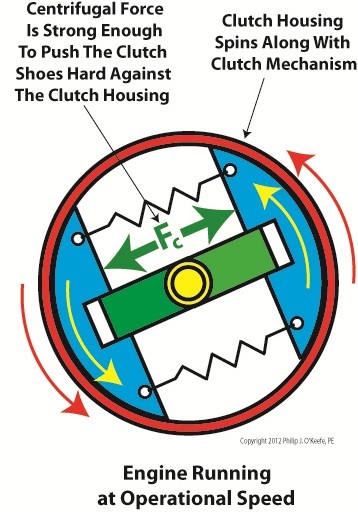 Like the brakes in cars, centrifugal clutch shoes also have linings as shown in Figure 1. Brake linings are typically made of a rough, high friction materials, such as ceramic compounds. These materials are bonded to the brake shoes, or in the case of clutches, to the clutch shoes. When centrifugal force comes into play, pressing the clutch shoes against the inside wall of the clutch housing, the roughness of the linings provides a good grip, preventing slippage between the shoes and the housing. 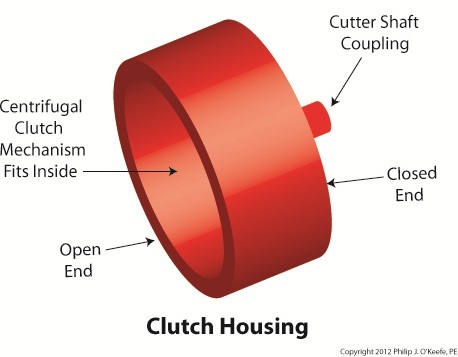 As we learned in previous articles, slip between the clutch shoes and clutch housings can create problems. In our grass trimmer for example, we learned that slippage reduces the amount of power the engine can effectively transmit to the cutter head. It also tends to produce a lot of heat. This heat can adversely effect the clutch springs and cause clutch failure. Although the high friction lining of the clutch shoes prevents most slippage, it can still occur, as when the throttle is depressed and engine speed increases beyond idle. There is some slipping as the clutch shoes first engage with the clutch housing, and it will continue until the engine speed increases to the point where centrifugal force causes the clutch shoes to firmly press into the clutch housing. Slippage also occurs when gasoline powered tools are subjected to operating stress. 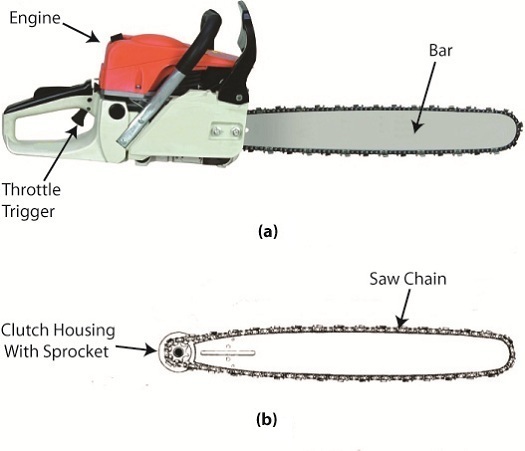 Figure 2 shows two views of a chainsaw. The first view is complete, the second shows the chain and clutch housing in isolation. With the engine housing removed, we see that the saw chain is connected to a sprocket located on the centrifugal clutch housing. This sprocket is similar to those that engage the chains on bicycle wheels. Now suppose someone decides to use the chainsaw to cut a green, sap-filled log. To make matters worse, let’s suppose the chainsaw has a dull saw chain. If you’ve ever tried doing this, you know that the sticky, sappy wood will eventually gum up the chain and stop it from moving. Since the chain is connected to the clutch housing, it stops as well. However the clutch shoes, which are driven by the engine, keep trying to move the gummed-up clutch housing, because the engine’s power is enough to overcome some of the friction. The result is that the shoes slip uselessly inside the housing. Over time, continued slippage will cause the clutch shoes’ high friction lining to wear away. Once the lining is gone the clutch shoes will slip excessively, even when the gasoline powered tool is being employed to perform the lightest task. That’s because slipping prevents a good portion of the engine’s power from being transmitted to the cutting head. That’s it for our series on centrifugal clutches. Next we’ll be discussing transistors, how they’re used in electronic controls to switch things on and off and perform other functions. Ever get out of bed on a cold winter morning and feel as stiff as a ladder? Summer’s heat doesn’t have the same effect on aging joints as winter’s chill, and many retirees have been motivated to move into warmer climates because of it. Heat can change the properties of metals like steel, too. By properties, I mean qualities such as hardness and stiffness–where hardness relates to steel’s ability to resist wear and denting, while stiffness relates to its ability to resist a force that is trying to bend it. Obviously, if things get hot enough, say in the thousands of degrees Fahrenheit, steel will soften and eventually melt into a blob of glowing liquid. At lower temperatures the change will be less dramatic, but its atomic structure will be undergoing change nonetheless. Varying temperatures cause atoms to become energized, causing them to move around within their atomic structure. Depending on how quickly things cool back down, the iron and carbon atoms that make up the steel can end up in different locations, causing a permanent change. The steel could end up softer or harder. For example, slow cooling hot steel in air makes it softer, while rapid cooling, such as when you submerge hot steel quickly into cold oil, makes it harder. How does heat play a part in the ongoing discussion of the centrifugal clutch in a grass trimmer? Well, friction between the shoes and housing generates heat as a result of centrifugal force. Clutch springs are made of steel, which is hard and resistant to bending. But during operation they may heat up to hundreds of degrees, then slowly cool down again when the grass trimmer is shut off. Without getting into a complex explanation of metallurgy, this slow cooling makes the steel in the springs softer, and with time they will lose their stiffness and weaken. Over time the springs become so weak they are unable to overcome the centrifugal force acting on the clutch shoes, causing the clutch to fail at its task of disengaging the cutter head from the engine at idle speed. In other words, as soon as the engine is started, the cutter head will rapidly begin to spin. With these conditions in place, the cutter head poses a threat to anything or anyone making contact with it. Next time we’ll look at another cause of centrifugal clutch failure, that is, component wear due to friction between the clutch shoes and clutch housing. I got my first 10-speed bike when I was in high school. It was nice, except for one nasty hangup, the brakes were always going out of adjustment. Once it did this at the worst of times, when I was going down a steep hill. I squeezed hard on the brake handles, and nothing happened. The bike started to go out of control in its ascent down the hill, and in desperation I took my feet off the pedals and pressed the soles of my shoes as hard as I could into the road surface. To my relief my emergency measure was effective. The harder I pressed into the pavement, the less my shoes slipped, and the more the bike slowed down. I had good rubber treads on the sneakers I was wearing that day, and the friction between the soles of my shoes and the surface of the pavement was strong enough to stop my runaway descent. 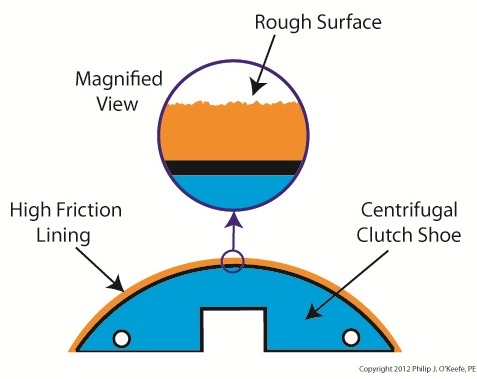 Something very similar occurs during the operation of a centrifugal clutch. If you recall from previous articles in this series, when the clutch mechanism spins faster than engine idle speed, the centrifugal force acting upon the clutch shoes overcomes the tension in the springs. This causes the clutch shoes to make contact with the clutch housing. But although there is contact, the clutch shoes will initially slip somewhat. That is, the clutch housing and cutter head won’t spin at exactly the same speed when a faster spin is first employed, although the slip between the clutch shoes and housing decreases as engine speed increases. Faster speed means there’s more centrifugal force at play, forcing the shoes harder against the drum of the clutch housing. The increase in centrifugal force makes the shoes move tighter and tighter against the housing, and this causes an increase in friction. Eventually the engine speed will increase to full throttle, the point where the shoes are pressed into the housing so hard there is no more slip. The cutter head will then turn at the same rate as the engine, and the engine’s power will be fully transmitted to the cutter head, allowing you to trim grass effectively. 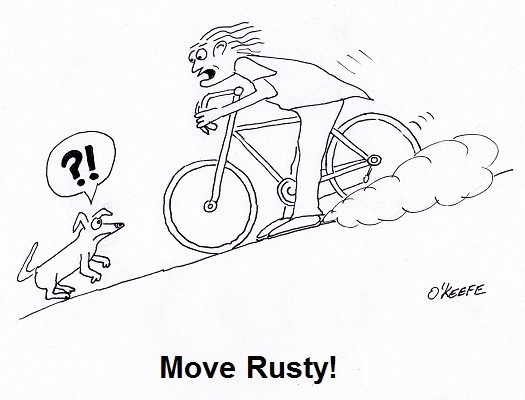 Friction is a double edged sword. On the one hand it reduces slip between the clutch shoes and clutch housing. On the other, the friction between the slipping shoes and clutch housing generates a lot of heat, particularly if the grass trimmer is cutting thick grass. We’ll see how that heat impacts the clutch mechanism components next week. Energy, or power, requires direct contact to transfer. In most cases. 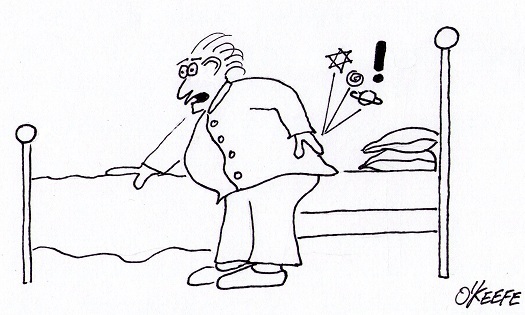 One notable exception to this rule of physics that I know of is the martial art of Tai Chi. But when we’re talking golf, for example, if you don’t’ make contact with that ball, it ain’t gonna fly, no matter how many swings you take. Last time we looked at a gas powered trimmer’s engine, centrifugal clutch mechanism, clutch housing, and cutter head and how they’re assembled together. With the centrifugal clutch assembled into the grass trimmer, let’s refer to Figure 1 to see what it looks like when we start the engine and run it at low, idle speed. Figure 1 represents a view from the back of the clutch housing, revealing the centrifugal clutch housing inside. At idle speed there are only a few millimeters of space between the blue clutch mechanism shoes and red clutch housing, but the important point is that they’re not touching the clutch housing. Because they’re not, the engine’s power can’t be transferred from the engine to the clutch housing, and it remains stationary, that is, the clutch housing doesn’t spin. Since the grass trimmer’s cutter head is coupled to the clutch housing, it also remains stationary. Figure 2 shows what happens from the same viewpoint when we press the throttle trigger, making the engine spin at operational speed. With the engine spinning faster the centrifugal force, Fc, acting upon the clutch shoes overcomes the tension of the clutch mechanism springs, and the shoes move away from each other along the green boss. They will eventually make contact with the clutch housing, enabling power from the engine to transfer to the clutch housing via the centrifugal clutch mechanism. The clutch housing and cutter head spin along with the engine, and we can now cut grass. When we let go of the engine’s throttle trigger it again slows to idle speed, the shoes no longer touch the insides of the clutch housing, and the housing and cutter head stop spinning, as we saw in Figure 1. Next time we’ll talk about centrifugal clutch failures, things that can go wrong with them and keep them from operating properly. Last week we looked at how a centrifugal clutch mechanism operates when it’s coupled to a gasoline engine shaft spinning at idle speed, and then we depressed the engine throttle trigger to speed things up. Let’s now introduce a new component called the clutch housing to see how it interfaces with the clutch mechanism to drive the cutter head in a grass trimmer. The clutch housing shown in Figure 1 resembles a rather short cup. One end is open, the other closed. Figure 2 shows the closed end of the clutch housing connected to the cutter shaft’s coupling. On the cutter shaft coupling resides a ball bearing which enables the clutch housing to both spin freely and act as a support for the clutch housing. The open end of the clutch housing allows the clutch mechanism to fit neatly inside. Next time we’ll put the assembly shown in Figure 2 into operation. First we’ll examine how the centrifugal clutch mechanism and clutch housing operate with the engine at idle speed, then compare that to the engine operating at actual cutting speed. I’m not a big fan of amusement parks. The first time I rode on a Tilt-A-Whirl I was caught off guard and flung onto my side by the centrifugal force acting upon my body, the lower half of which was constrained by a seat belt so I wouldn’t be catapulted out during the ride. To make matters worse, the centrifugal force started to force the lunch I’d made the mistake of eating just before back up my throat. It was a very unpleasant experience to say the least. Centrifugal force is an interesting phenomenon, and its principles are involved in the operation of a centrifugal clutch, which we’ll see later. For now, let’s get a basic understanding of what it’s all about, thanks to the discoveries of Sir Isaac Newton in the late 17th Century. Centrifugal force in the simplest of terms is an outward-pushing force that pulls objects in motion away from the point about which they’re rotating. 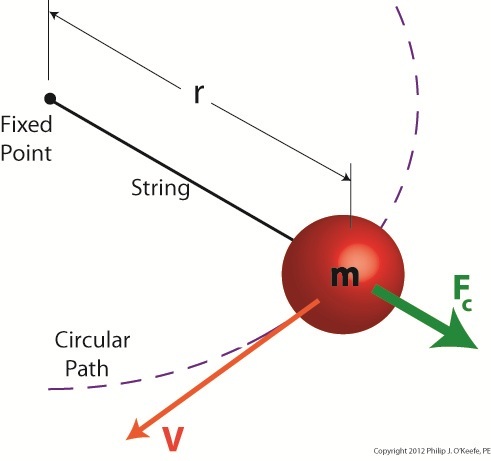 Let’s hold as fact that if m and r don’t change, then Newton’s equation tells us that the centrifugal force exerted upon the object in motion increases by the square of the velocity, or speed, of the ball. In other words, the faster the ball moves as you spin it around your head on the string, the harder the centrifugal force that acts upon it. As you spin the ball faster and faster, it will pull outward more and more strenuously, exerting ever greater resistance upon the string you hold between your fingers. Now suppose we replace the string in this example with a spring as shown in Figure 2. Why a spring? Because that’s what’s used within a centrifugal clutch. Just as with the string, the ball’s velocity increases as you increase rotation speed around the fixed point, and the centrifugal force acting upon its mass by the spinning action increases as well. The spring expands, extending further and further out from its beginning position of attachment to the fixed point, your fingers. 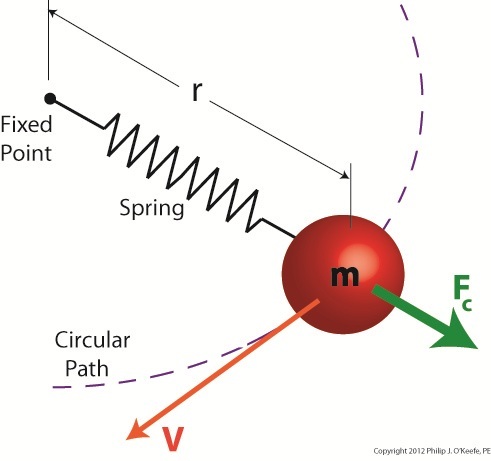 As velocity decreases, the spring will retract, eventually returning to its original coil size. This extending and retracting action is the major mechanism at play within a centrifugal clutch. 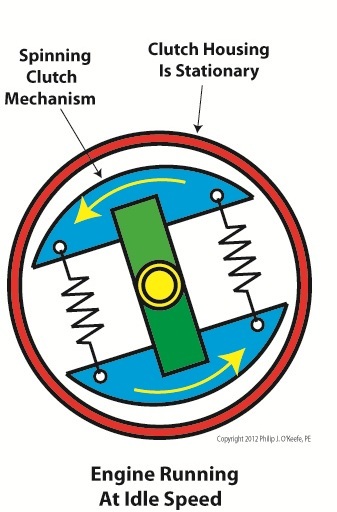 Next time we’ll explore a centrifugal clutch mechanism in more depth to observe its behavior relative to its spring under the influence of centrifugal force. I remember the days when trimming grass around trees, fences, and flower beds involved the use of hand operated clippers. You know, those scissor-like things that require you to squeeze the handles together to move the blades. Cutting seemed to take forever and there was a lot of bending, stooping, and kneeling which would kill your back and turn your knees green from grass stains. Worst of all, the repetitive motion of squeezing the handles dozens of times would cramp your hands. It was a great day when gasoline powered grass trimmers came along. Just pull the recoil starter cord and you’re ready to go. It’s fast, easy, and the final result looks better too. If you’ve ever operated a gasoline powered tool like a grass trimmer, you probably noticed that the cutter action isn’t immediate once the engine is started. Instead, the engine enters into a much slower initial speed mode, the idle speed. The cutter moves only after the throttle trigger is depressed. This introduces more gas to the engine, causing it to speed up, and this action is due to a device called the centrifugal clutch. A centrifugal clutch, or any type of clutch for that matter, serves one basic function, to physically disconnect, then reconnect a gasoline engine from whatever it is powering. For example, if the engine in a weed trimmer stayed permanently connected to the cutter when the engine was started, it would pose a definite safety hazard. Even at idle speed, the cutter would immediately kick into high speed operational mode, and if someone wasn’t prepared for this instant response there would be a good probability of injury. 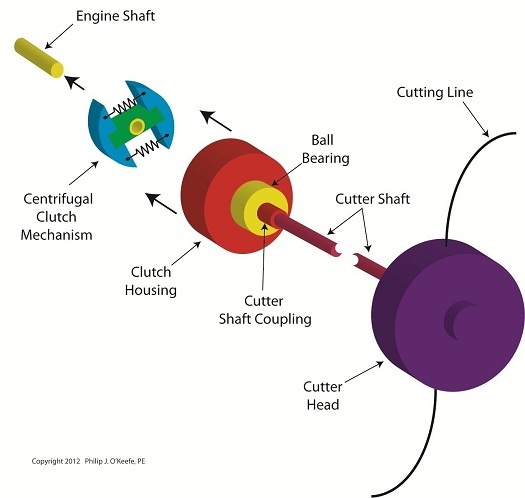 When a centrifugal clutch is placed between the engine and the cutter, it automatically disconnects the engine from the cutter during starting and at idle speed. We’ll see how it does that in a later blog. For now, let’s consider the fact that the idle function serves as a “get ready.” The user is able to both psychologically and physically prepare themselves to use their tool. Pressing the trigger revs the engine up and causes the centrifugal clutch to connect the engine to the cutting action. When the operator takes their finger off the throttle trigger the engine returns to idle speed, and the clutch automatically disconnects the engine from the cutter. The cutter becomes idle. 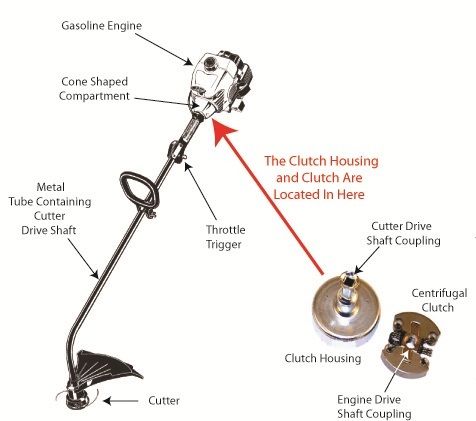 Figure 1 shows a gas trimmer and its centrifugal clutch. The engine is on one end of the trimmer and the cutter at the other. A hollow metal tube runs between them. This tube contains the cutter drive shaft. The centrifugal clutch and its clutch housing are located in a cone shaped compartment between the engine and the metal tube. The clutch is connected to the engine drive shaft and the clutch housing is connected at the other end of the cutter drive shaft. When they’re assembled into the grass trimmer, the clutch fits within the clutch housing. Next time we’ll see how the centrifugal clutch on a grass trimmer uses centrifugal force and friction to automatically transmit mechanical power from the gas engine to the cutter.